Japanese manga (comics) and anime (cartoons) have long been very popular both in Japan and abroad. Now they are grabbing even more hearts around the world as some comics go on sale outside Japan. 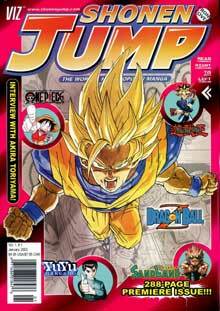 In late 2002 manga magazines Shonen Jump and Raijin Comics and anime magazine New Type were successfully launched in North America. The biggest news was the publication of a monthly English version of Weekly Shonen Jump (site is Japanese only), which with a circulation of over 3 million is Japan's best-selling boys' manga magazine (Shonen means boy). The first issue of the English-language version was published in November in the United States and Canada with a planned circulation of 250,000. An additional 50,000 copies had to be printed quickly in order to meet demand, according to Shueisha, the publisher of the original Weekly Shonen Jump. Viz Communications, the Los Angeles-based publisher responsible for the translation and marketing of the English Shonen Jump, aims to achieve a circulation of 1 million within the next three years. That goal seems quite possible, judging from the rave reviews on websites of major online bookstores. An 11-year-old boy claims to have "fallen in love" with the magazine, while one girl recommended it for "anyone interested in the success of anime and manga in the U.S."
Japanese comics are completely different from American ones. They are as thick as a phone book with more than a dozen different stories presented in serialized format. Shonen Jump gives readers a taste of the original, with the premiere issue running to 288 pages and featuring five stories - Dragon Ball Z, Yu-Gi-Oh!, Yu Yu Hakusho, SandLand, and One Piece. American readers are probably familiar with the anime versions of the first three. SandLand, the latest from DBZ creator Akira Toriyama, is about a weird quest for water led by a little demon prince. One Piece, one of the hottest manga among Japanese kids right now, follows the adventures of Monkey D. Luffy, a pirate wannabe. Manga magazines are where many anime hits originate. Cartoon characters like Goku (DBZ) and Kinnikuman (Ultimate Muscle) debuted in Weekly Shonen Jump. The English-language version of Shonen Jump has not been edited for Western readers as most manga are, so readers are able to enjoy the way the story and characters of their favorite anime developed as drawn by the creators in the original Japanese manga. One thing may confuse some readers at first. Shonen Jump is read from right to left, like any Japanese magazine. Technically, that makes things tough for translators. But it's perhaps not as challenging as coming up with the countless sound effects that are typical of manga. For example, the imaginary Japanese fanfare "Jaaaan!" that trumpets the appearance of a character has been translated as "TaDaa!" in English. Along with a very rare Yu-Gi-Oh! game card, the opening issue of Shonen Jump carried interviews with manga artists and columns on manga, including one describing how artists start their careers by sending their work to major magazines. In the future, promising manga creators outside Japan could have their work published in Shonen Jump and maybe even translated into Japanese for readers in Japan!